Closing date for entries: Fri 2nd November, Noon. Max 2 entries per person, no backlinks. The winners of Week 41 are at the end of this post. 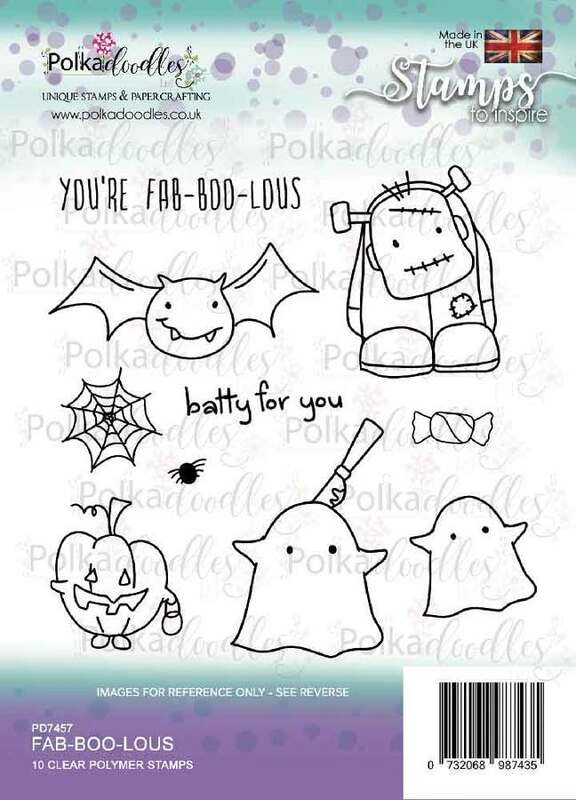 Anna - Halloween will be soon and I thought of making a home decor with the paper from the Winnie Wednesday Halloween collection. 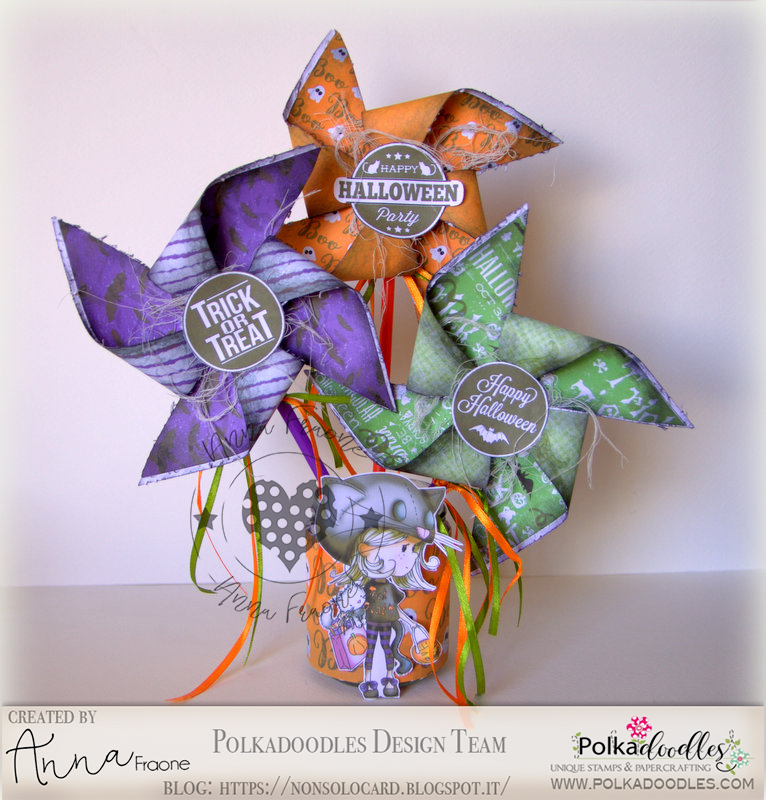 I created some pinwheels in the three typical colors of Halloween, purple, orange and green, and I stuck behind a straw that I put in a mason jar full of colored sand and decorated with a pre-colored stamp. 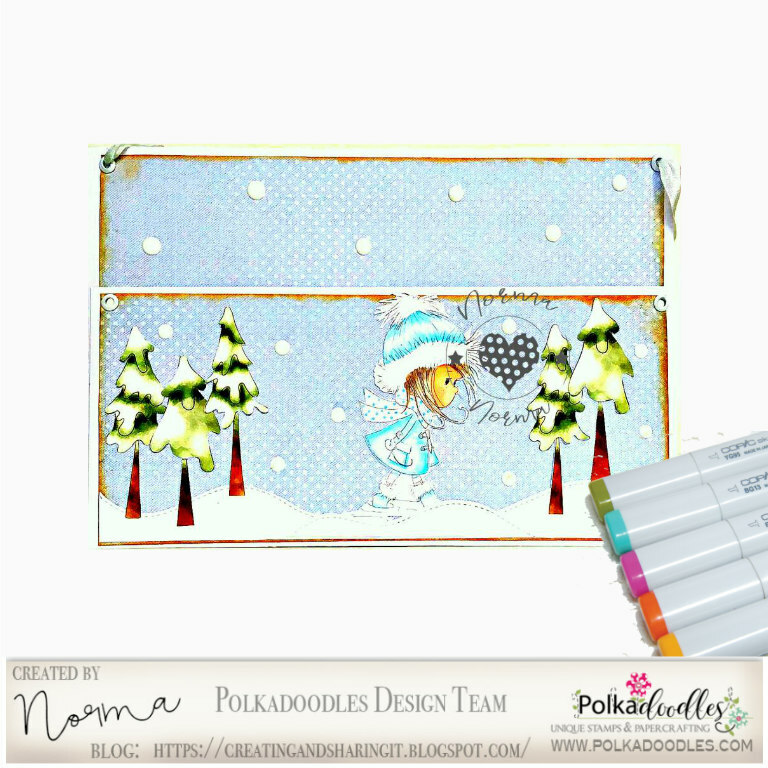 Mary I decorated a plain papier mache box with 3 sheets of paper from the Winnie in Winterland collection. I used two sheets for the sides, edge of lid and top of box and with the third sheet (Paper Heaven 4) I made 3 flowers and some ivy and rose leaves from Paper Heaven 5. To augment the paper flowers I added some small rose buds in toning colour and some tiny pearl clusters on silver stems. 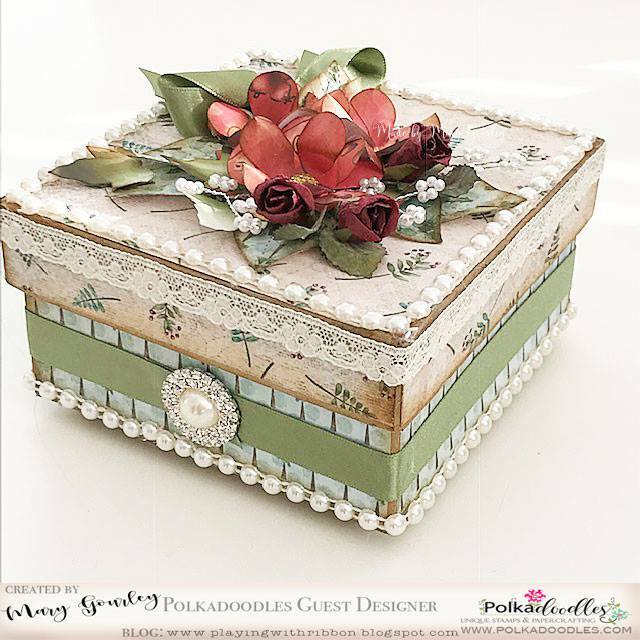 To finish the box I added lace, ribbon, diamante embellishment, pearls for the feet and edges of the lid etc. 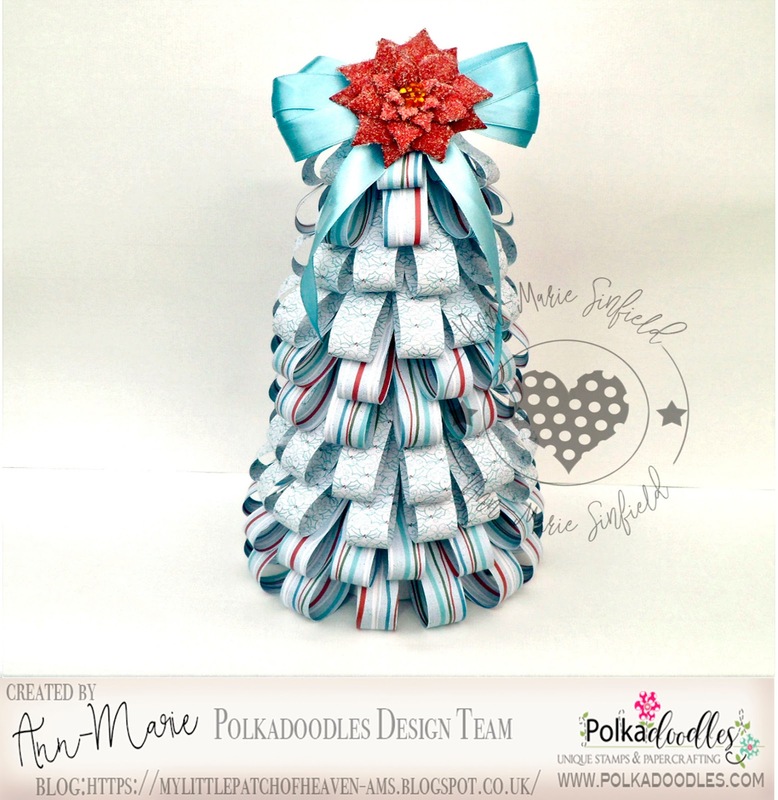 Ann-Marie for my 'focus on paper' this week I decided to have a go at making a ribbon Christmas tree but with strips of paper ribbon instead of actual ribbon. 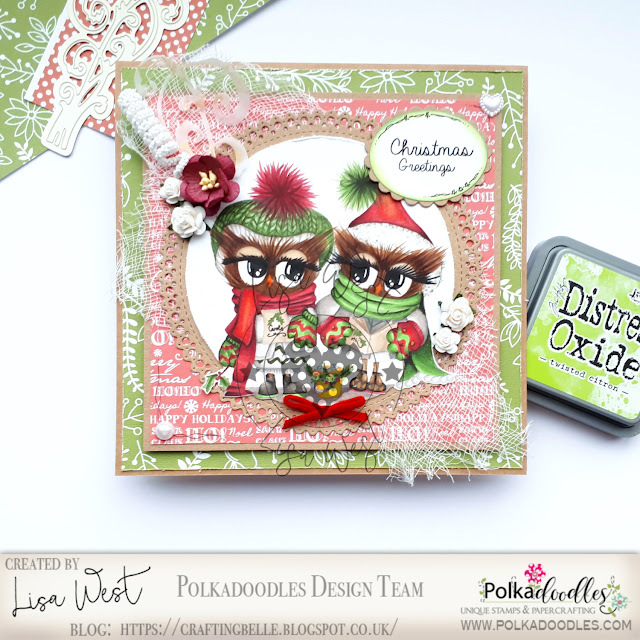 I used papers from the Winnie White Christmas Big Kahuna download kit and as it was digital there was no fear of me running out I could print paper off to my hearts content. 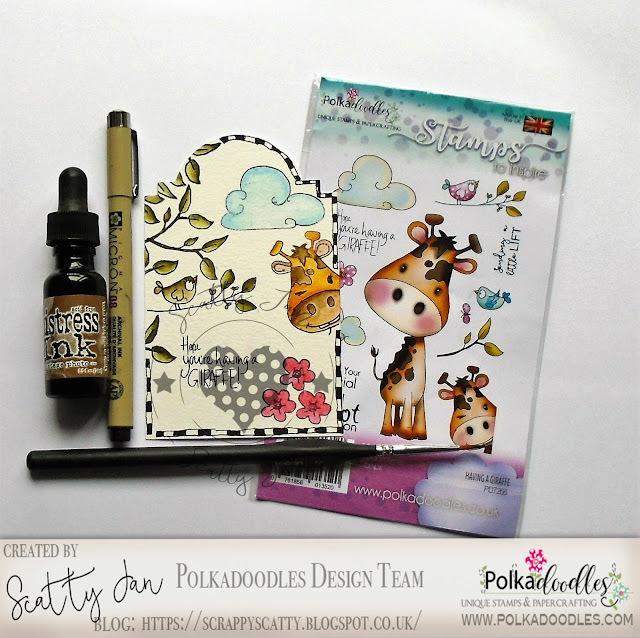 Don't you just love that about digital kits! from Winnie Winterland Big Kahuna bundle, I also used them to paper piece Winnie's Dress/Shoes and Gift. Norma Does it happened to you that you fall in love with a paper? 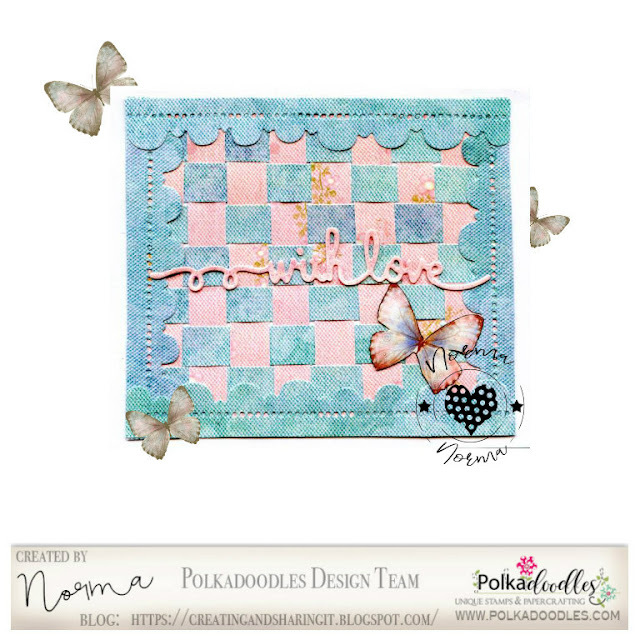 well, I love the ones that have pink and blue, and I got this papers for the Lil miss sugar pops and the beautiful butterflies from Belle papillon collection, both are very pretty and you can adapt them to any project. Fleur - I have used papers from - horace and Boo collection and sentiment is from - Winnie download collection I have distressed all papers and added a few pearls. Please email us HERE, quoting the following code PD0wk41001 to claim your prize of $10 worth of downloads from the digi store. Claims must be received by 10/11/18, please refer to Challenge rules at top of blog. Please email us HERE, quoting the following code PD0wk41123 to claim your download voucher from the digi store. 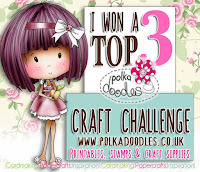 PRIZE: $10 gift voucher to the Polkadoodles Store - available to spend on anything you wish, whether it's dies, downloads, stamps, papers - anything! Closing date for entries: Fri 26th October, Noon. Max 2 entries per person, no backlinks. The winners of Week 40 are at the end of this post. Cindy I have used the digital image Winnie Wonderland - North Pole and the digital paper of Winnie Wonderland paperheaven 1 . I have colored with copics and made the flowers myself, spraying them with red ink en using microbeads for the inside of the flower. Beata made birthday card. Without any images, but with a lot of flowers, jets and istle. 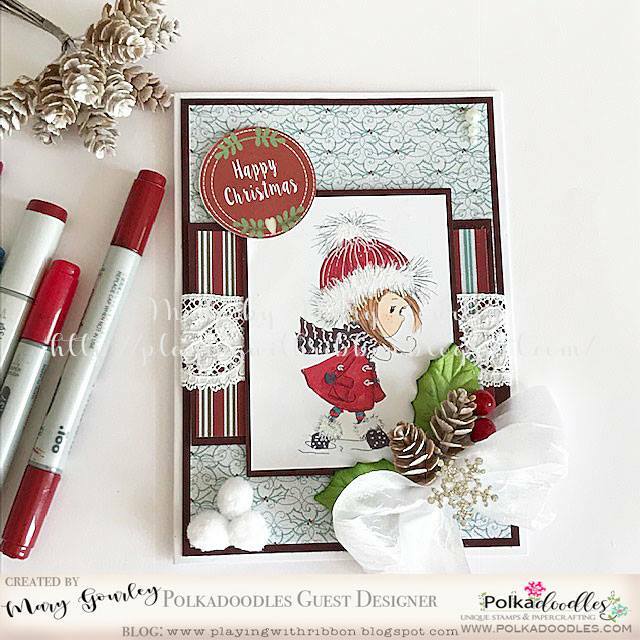 She used stamp, which you can find for free and buy as extra gift from Polkadoodles "Birthday hapiness sentiment downloadable digital stamp" and mixed papers from "Printable Papers 1 Winnie White Christmas digi downloads"
Judy: My card was created by casing a layout by Andrea, which you can find here. I used Windy Day from Winnie Special Moments for the image, Rose Budd Collection for the papers and the sentiment is from Winnie Celebrations 1. Ruth: The DT were challenged to CASE a fellow DT and to say who it is. I've gone for Andrea - I like her layouts and pins! And because I recently remembered I had a fair few pins in my stash, it was perfect! I've used paper from the Itsy Ditsy 6x6 pad plus card from my stash to cut the Bubbleicious frame die. The image is Earlie Hedgehog Balloon which I've coloured with promarkers and added glitter glue to her balloon. Ribbons and pins are from my stash. Please email us HERE, quoting the following code PD0wk40001 to claim your prize of $10 worth of downloads from the digi store. Claims must be received by 01/11/18, please refer to Challenge rules at top of blog. Closing date for entries: Fri 19th October, Noon. Max 2 entries per person, no backlinks. The winners of Week 39 are at the end of this post. 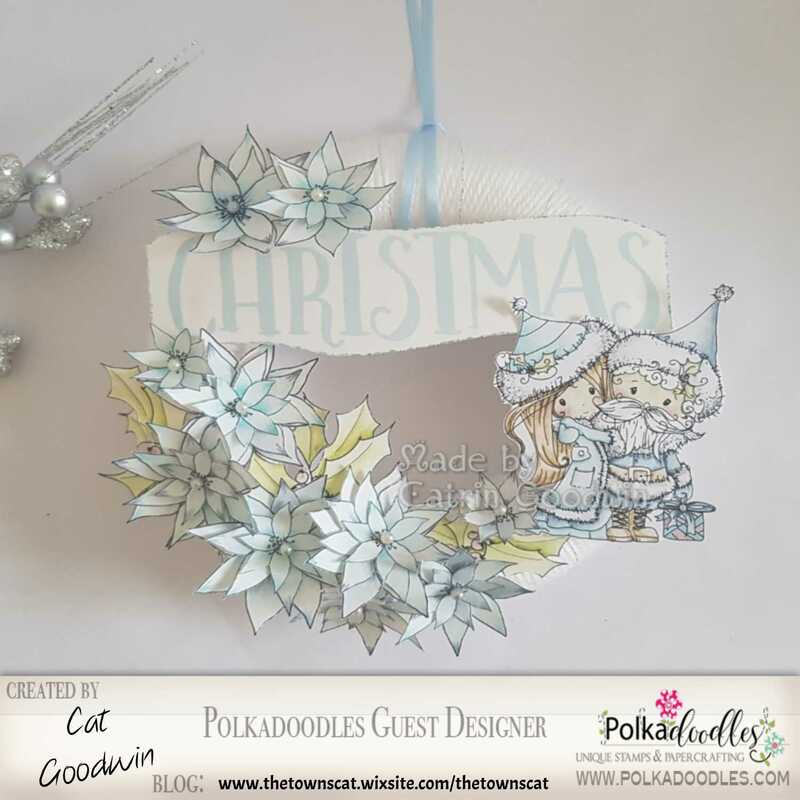 Suzi - I made a Gift tag using the sweet Winnie Angel Delivering Candy My papers are from Winnie Winterland Big Kahuna bundle, sentiment is from Winnie White Christmas Big Kahuna Bundle. I fussy cut sweet Winnie and the floral arrangement. Gina for my card this time, I have coloured up the very beautiful Frosted Fox. 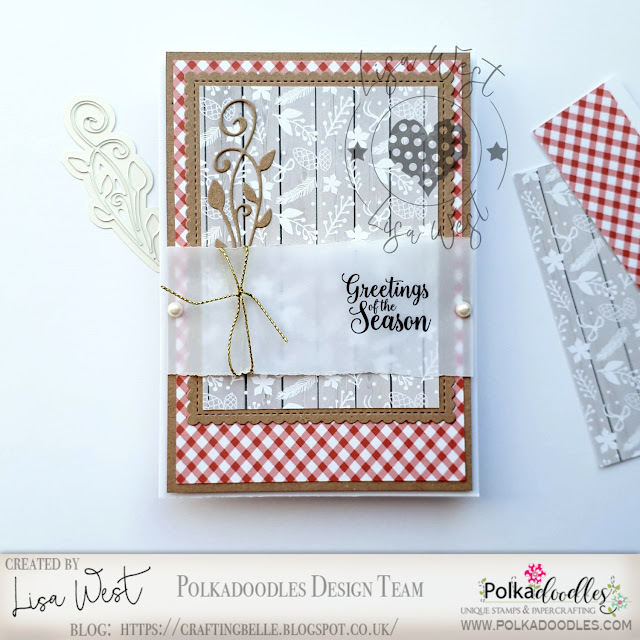 I have teamed her up with papers from Winnie White Christmas Papers 1. The sentiment is from Winnie White Christmas Big Kahuna Kit. 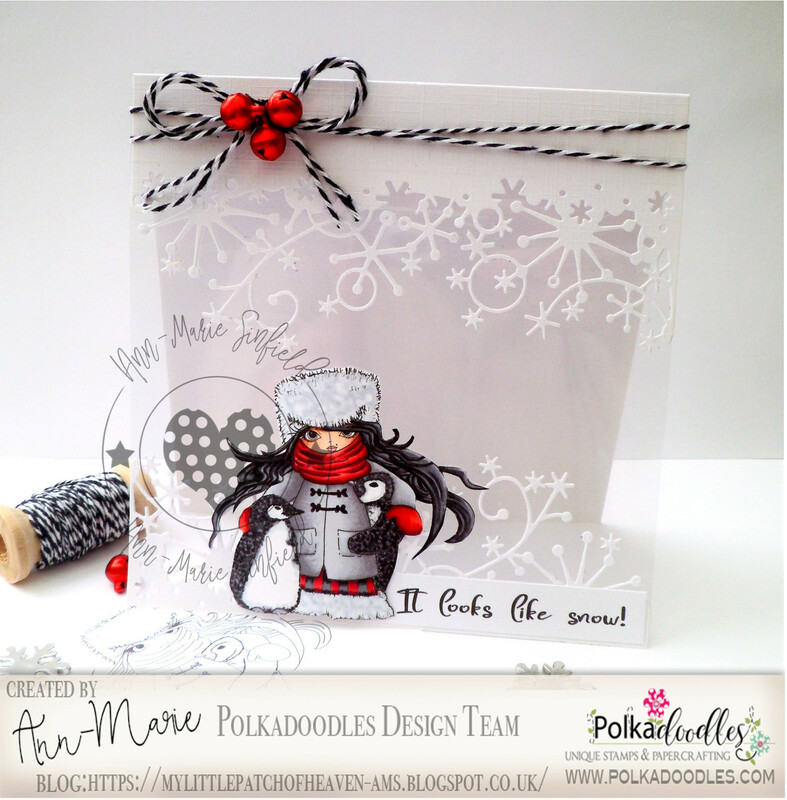 Ann-Marie - My card is made using the gorgeous 'Frosty Penguins' image teamed up with a sentiment from the Winnie White Christmas Big Kahuna download kit. Anna - This week I created a Christmas tree shape tag ... 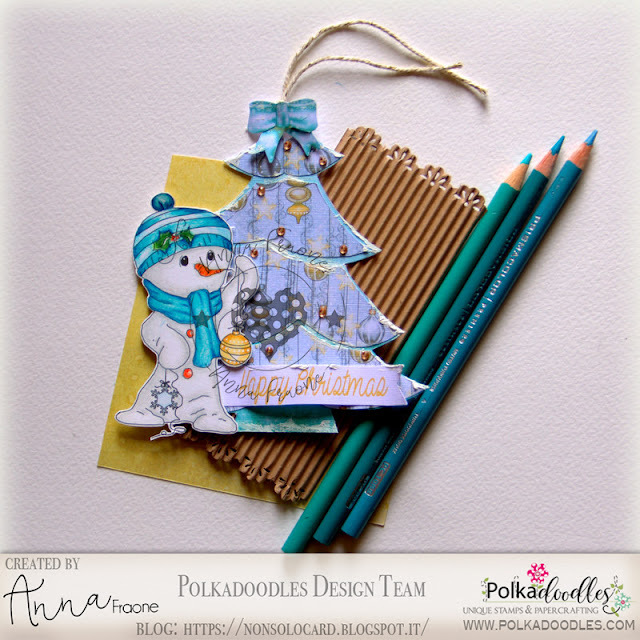 I decorated it with this fantastic little snowman colored with Prismacolor! 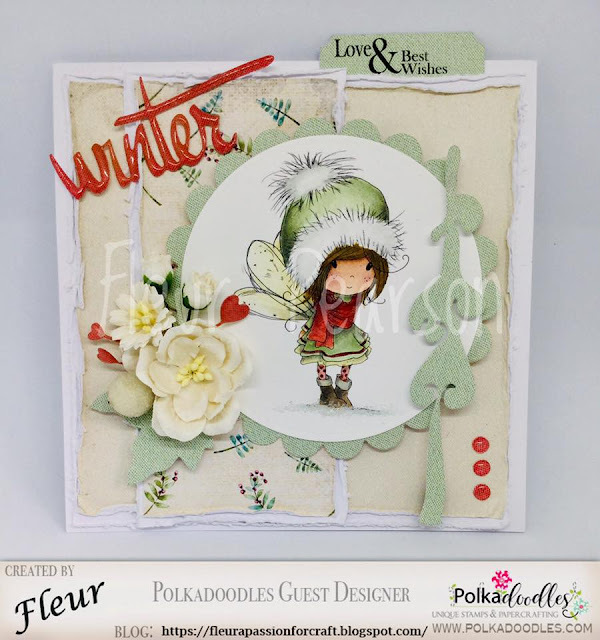 The cards and the stamp I used are all in the Winnie Winterland bundle. How nice to decorate the tree !!!! Please email us HERE, quoting the following code PD0wk39001 to claim your prize of $10 worth of downloads from the digi store. Claims must be received by 22/10/18, please refer to Challenge rules at top of blog. 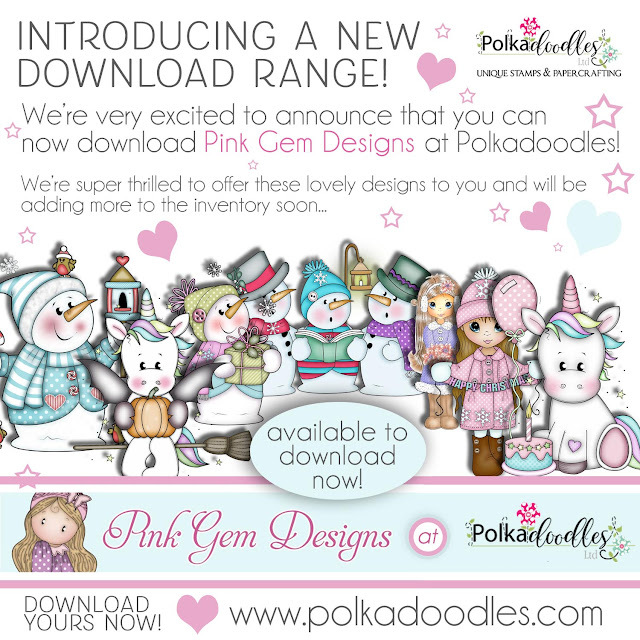 Please email us HERE, quoting the following code PD0wk39123 to claim your download voucher from the digi store.